Media Composer locators do not translate to DS via AFE conform. To alleviate this limitation you can use Markercon v0.9. 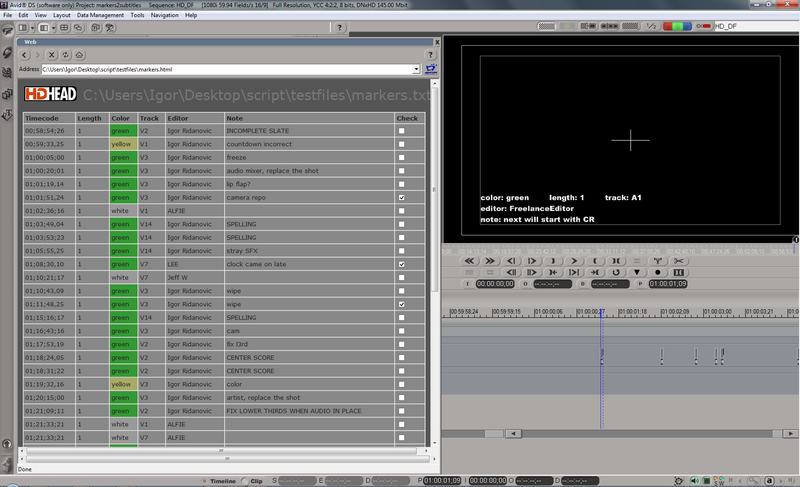 Markercon converts Avid Media Composer markers (locators) to Avid DS subtitles and an HTML table. Markecon supports Media Composer 7 spanned markers. The HTML output of Markercon can be used outside of DS. For example, the formatted HTML file can be sent to a client instead of a marker plain text file. The checkboxes in the HTML table are for editor’s convenience only and are not persistent. Markercon is available from HDhead.com. You must install Python 2.7.6 (or any pre-version 3.0 build). The installers are located here: __http://www.python.org/download/releases/2.7.6/__. Select one that is appropriate for your system. The markercon.py script file can be saved anywhere on the system. OSX comes with Python already installed and requires no additional installation unless drag-and-drop functionality is desired. Drag-and-drop the text file onto the Markercon icon or shortcut. Markercon will generate an HTML file and a subtitle file and save them next to the source file. Open the subtitle file in DS. If desired, open the HTML file in the DS browser. The command line operation of Markercon allows selection of font size. The optional argument s will create small font size. Omitting the argument will default to the large font size. Substitute your custom file path and name. Importing subtitles of incorrect frame rate or mismatched DF/NDF timecode will cause DS to crash. Unlike Media Composer markers, DS subtitles do not allow more than one subtitle per timecode. Due to internal subtitle limitations in DS, spanned markers appear as single frame subtitles with correct duration noted in the “length” field.